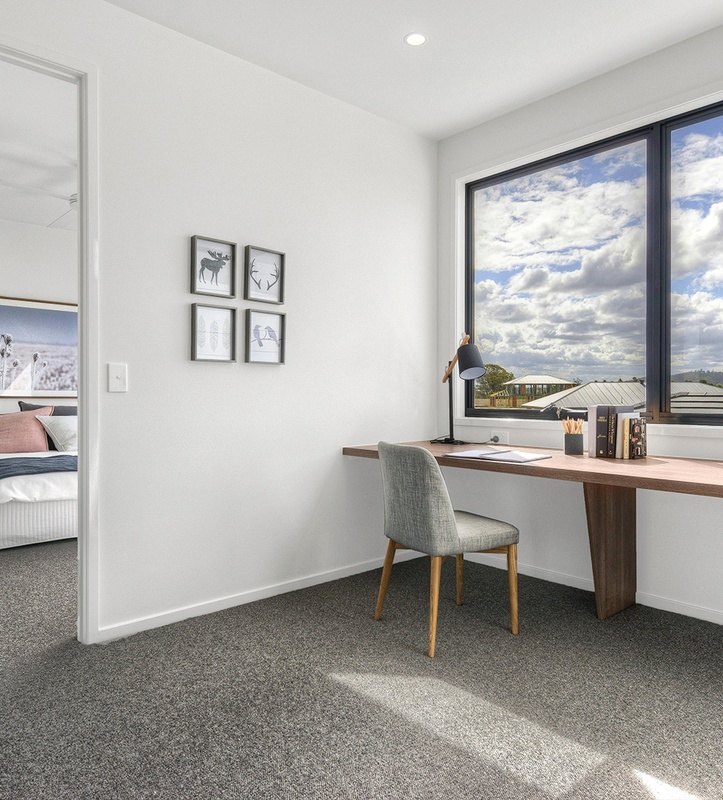 Whatever stage of life you may be, it seems we all need a place to ‘dock’ and ‘log on’ when we open the front door, and study or office spaces are starting to be a necessity for new homes. 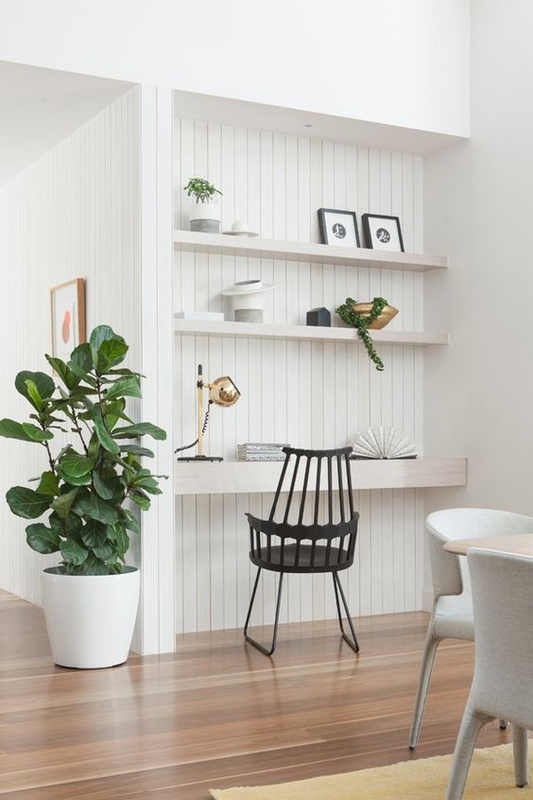 A bench top with one or two floating shelves above is a basic configuration for any study nook within the home. The bench top acts as the work space and the shelving as either storage or display space. Ensure that you have adequate tasking lighting and that power points are positioned up high, underneath the bench top so that cords can remain out of sight. A cable hole cut out with a cover can be fitted to the bench top so that cords can be fed through. In this example a small space has been taken from the adjacent room to accommodate this arrangement. The VJ wall panelling has been continued along the back wall which helps to seamlessly integrate the design with the rest of the home. 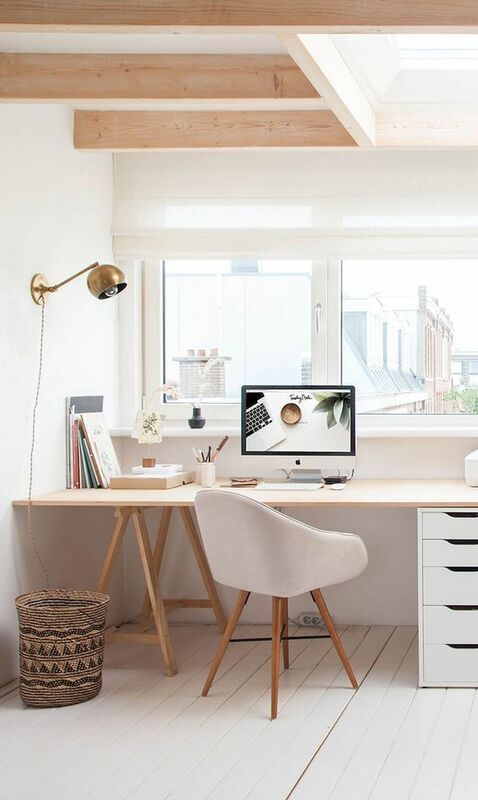 If you can spare some space in a bedroom, a desk top and shelving design is a smart addition. This nook as has been beautifully balanced with the adjacent wardrobe doors, using the same palate of finishes to create an elegant and seamless design. Integrating a slimline drawer below the bench top is a great way to add concealed storage space for all those little bits and pieces. When not in use, this nook could also double as surfaces to display and store other personal belongings. The kitchen is the heart of any home and where most people gravitate towards so, if space allows, you could consider incorporating a bench top and some shelving into nook from which you can co-ordinate the social calendar, plug in the household devices to charge and play music etc. Keeping the finishes and colours similar to those of the kitchen will give you a more seamless connection. A stool or compact seat that can be tucked away when not is use is a great option. 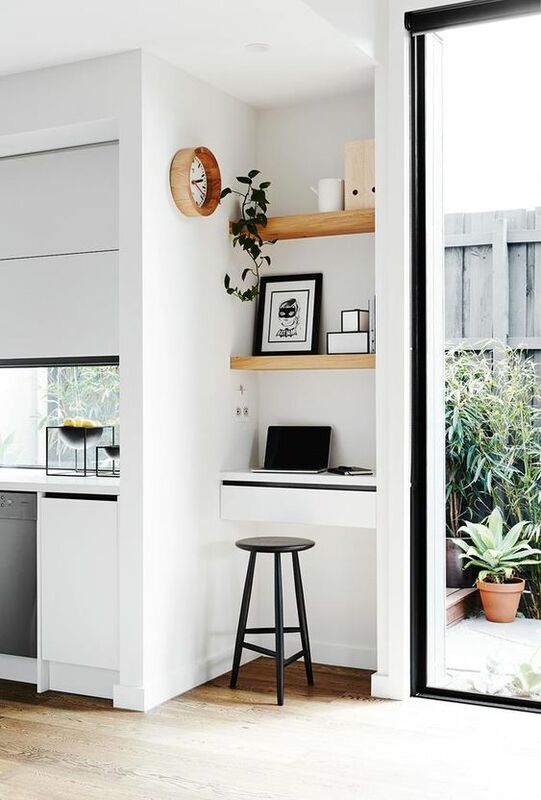 Study nooks are generally preferred located near high traffic areas of the home so they can be easily accessed and utilised (such as the kitchen/dining/living zones for instance). The obvious downside to this is that it often becomes a dumping ground for everyday items at the end of the day. To avoid a mess being on display, consider installing some pocket sliding doors that retract back into the walls when open. This will free up surrounding circulation space and give you the ability to close it off when the mayhem gets a little too much. 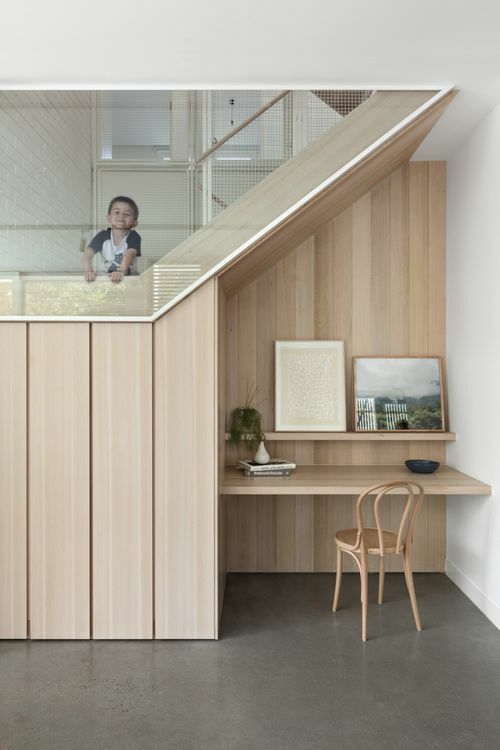 Utilising space that you may have under a set of stairs instead of the usual storage room that might be there, means you can create a room of its own. If a study nook is going to be more valuable to you than a console or a feature armchair, why not fill the space with an integrated bench top, shelving and concealed storage. Just remember to include provision for good task lighting when natural light is limited. 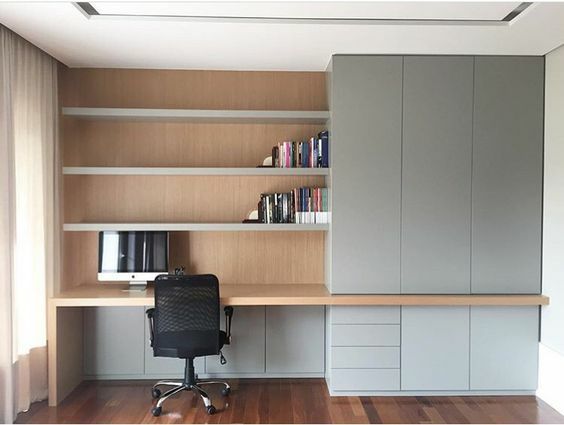 This study requires a little more wall space but is still a compact option with great integrated storage to hide away files and stationary; a great design for a home office and for those working from home. The storage could also double as space for linen, board games, and other miscellaneous items as a home can never have too much storage. This lovely balance of colours creates a neat, smart and inspiring space to work in. If you are someone who works from home, investing in custom bespoke joinery provides efficient use of space and creates an inspiring environment to work within may be worth your while. A design that combines ease-to-access open shelving with concealed cupboard space (such as this) is an efficient design as it allows your desk to be clutter free. Located next to a window, it provides great natural during the daylight hours. A study nook is a great space to add that burst of colour you’ve been wanting to use somewhere in your home but haven’t had the courage. 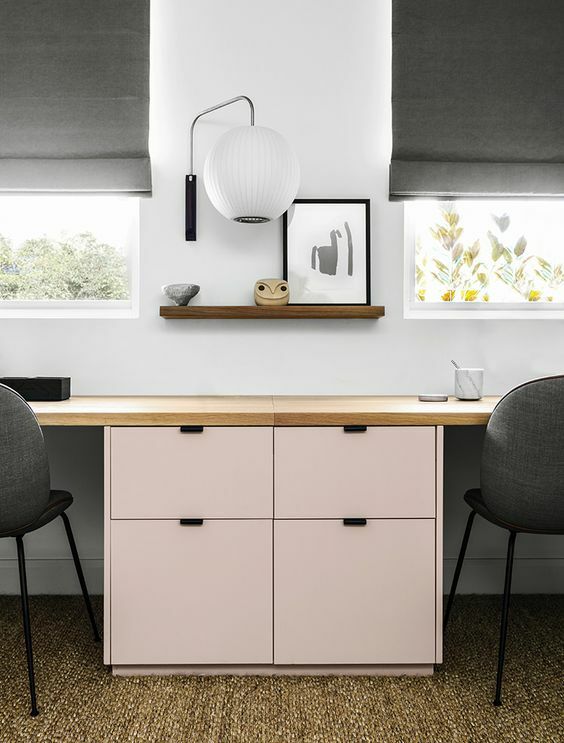 A soft pink has been applied to the storage drawers of this study nook, providing a playful and bespoke touch to the space. (Try Dulux Watermelon Milk Half to achieve a similar look). 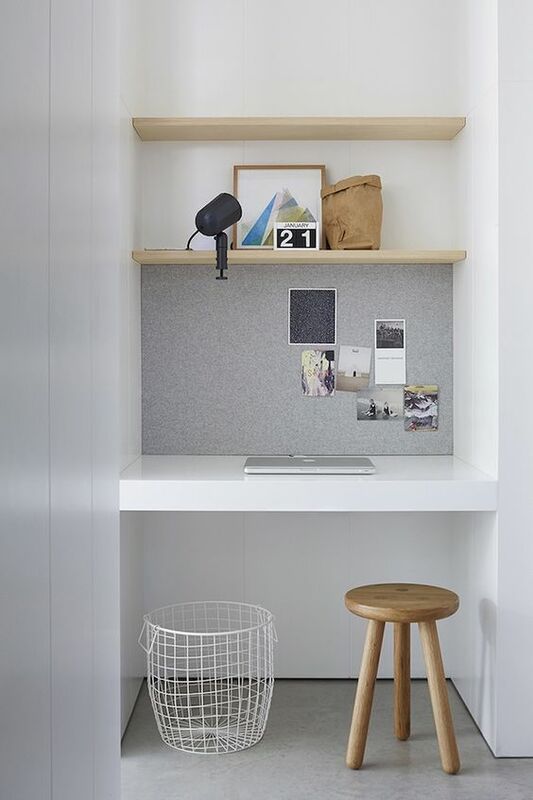 Installing a pin board to the back wall of a small study nook is a great way of efficiently using the space for organising important documents and invitations that you don’t want to miss. Products such as Echopanel, enable you to selection from a range of different colours and patterns that can be cut to a custom size. 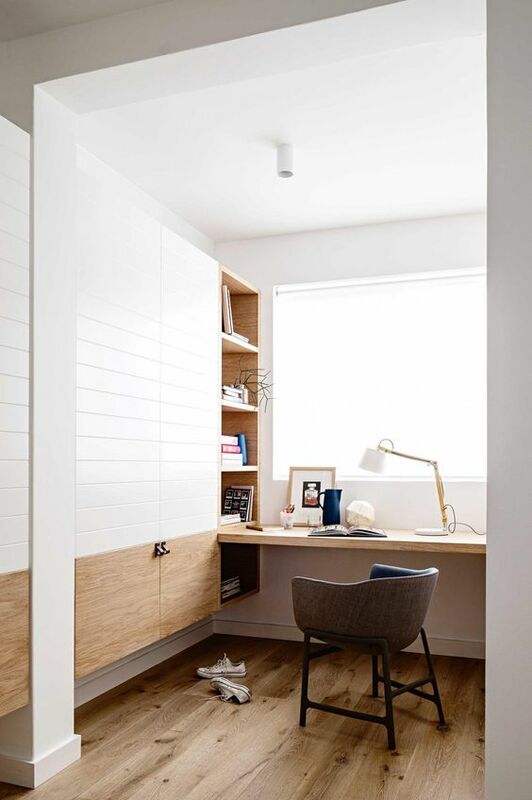 If your budget just isn’t allowing for a custom joinery piece, there are many economical ‘off-the-shelf’ options available to fit out your study nook. Here a simple plywood bench top, an easel table base and a set of IKEA drawers have been installed to create a cost effective and smart design. There is plenty of bench top space with adequate storage, and the finishes and colours all work perfectly in the surrounding area. Locating a study near a window also means the space is well lit with natural light during the daylight hours.